news Global technology giant IBM last week officially opened a new client experience centre in Melbourne where it will show off its Watson artificial intelligence platform, which is increasingly being adopted by major Australian organisations such as Deakin University, ANZ Bank, Customs and Woodside. Watson is an artificial intelligence platform which is capable of answering questions posed in natural language — the language that ordinary humans speak. The system was developed to compete on the quiz show Jeopardy! — which it won — but has since been adapted to be used in many corporate applications. Watson particularly specialises in providing access to unstructured data — which IBM believes represents about 80 percent of the world’s data. 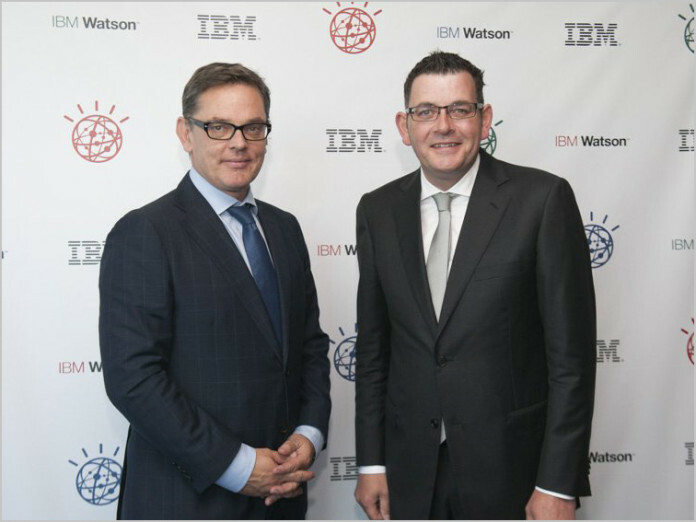 Last week IBM was joined by Victorian Premier Daniel Andrews (pictured, above right) to officially open Australia’s first IBM Watson Client Experience Centre in Melbourne. The centre will provide Australian businesses and organisations with the ability to experience and explore Watson, and also access to a global support network of 2,000 technology and industry experts. Big Blue said in a statement that today hundreds of organisations across the world were using Watson in a variety of industries, including healthcare, financial services, law, retail, culinary arts and education. A world first, Deakin University is using IBM Watson to create an intelligent digital guide for students. The Watson technology is embedded in DeakinSync, a digital hub designed to provide students with their information needs from any location at any time of the day. ANZ Global Wealth is using Watson at the Sydney Grow centre to power an investor engagement advisory tool. The bank’s goal is to shorten and improve the process of providing financial advice, by a matter of weeks, by matching client requirements to market offers. The Australian Customs and Border Protection portfolio is breaking new ground as it uses Watson to help analysts within the portfolio to draw further insights from unstructured data sources such as news feeds and government reports. Woodside is using Watson as part of the oil and gas company’s next steps in data science. Trained by engineers, Watson will enable users to surface evidence-weighted insights from large volumes of unstructured and historical data contained in project reports in seconds. The centre in Melbourne will now enable organisations to explore how Watson can help it transform to become truly cognitive. It can also serve as a collaboration hub for enterprise and government, local start-ups, developers, partners, venture capital groups and academic experts to support a new era thinking in Australia, enabled by cognitive technology. “IBM has a long history of investment in Victoria – from the opening of IBM Research and Development Lab, IBM Global Delivery Centre in Ballarat, IBM Studio and Australia’s first SoftLayer IBM Cloud centre. We are delighted that the Watson Client Experience Centre in Melbourne will enable us to combine our leading edge technology in a collaborative environment, so that business leaders and government can have face to face access to these technologies and experts,” said Kerry Purcell, Managing Director, IBM Australia and New Zealand (pictured, above left). I still remain skeptical about the actual value which artificial intelligence platforms such as Watson offer to Australian organisations — and I am sure IBM is still in the early adopter phase for the technology, where it incentivises them to use it as early test cases, rather than charging them through the neck for it. However, it is true that the technology is being adopted in Australia. In this context, I welcome last week’s launch in Melbourne. It will be interesting to see if we see further Watson adoptions off the back of this kind of launch over the next couple of years. “Watson AI? elementary my dear Watson”. Someone had to post it. So I took one for the team.